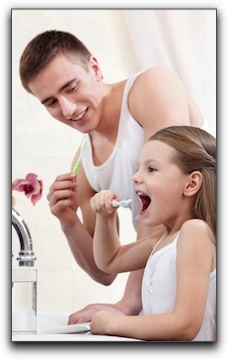 Parents who want their children to have good dental health know that they need to set the right example. That means teaching good dental hygiene, and bringing them in to The Plano Dentist for a checkup and cleaning every six months. If we want our kids to be active, we should get off the couch ourselves. If we want our child to choose an apple over a cookie, we better not be snacking cookies ourselves. What about dental health? Do our children see us brush and floss after meals? Do our children find water bottles in our car cup holders, or do they find empty sports drink cans? Do we see the dentist regularly? Tooth decay is the second most common childhood health problem, after the common cold. If you have a newborn or toddler, you have a fantastic opportunity to establish daily habits for lifelong oral health. It may seem that cavities are inevitable. At The Plano Dentist, we don’t buy it. There is a lot you can do to keep your child’s baby and adult teeth cavity-free. In fact, there are vital things to do even before your baby’s first teeth come in. Don’t put your baby to bed with a bottle. Wipe milk or formula off their gums with a soft, damp cloth after feeding. Don’t let your infant drink juice all day. If you want your baby or toddler to drink between meals, water is just fine. The family dentistry from The Plano Dentist provides everything needed for healthy young mouths, from cleanings and checkups to dental sealants. For our adult patients, we provide a range of cosmetic dentistry procedures, from teeth whitening to porcelain veneers. Schedule an appointment with us today.